Developer Frogwares has an impressive track record, but what the studio is doing in The Sinking City is more ambitious than anything it’s done to date. Their upcoming PS4 detective RPG is set in the fictional 1920s city of Oakmont where supernatural floods are driving the residents - and player character, investigator Charles W. Reed - to madness. 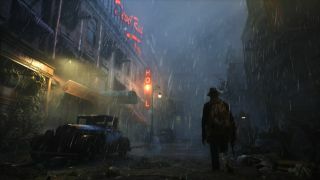 The Sinking City should appeal to adventure fans with its focus on lateral thinking; an open-world fusion of LA Noire and Call of Cthulu that relies on its players' piecing together clues about where to explore, rather than steer you with flashing mission markers. We were impressed by its unpredictable NPCs and illusion of a living, breathing city. Official PlayStation Magazine sits down with CEO Wael Amr to discuss what it took to create Frogwares’ first open-world adventure, and how Lovecraft’s mythos differs from the world of Sherlock Holmes. is something else. How did you accomplish that? Wael Amr: The first thing that we had to do was to completely reformat the way that the team was working, change the full organisation of the team, change the experiences, and the way we were working – all without growing the team, actually. And that was a base to be able to create an open city game. I think, in Devil’s Daughter, we had around 800 metres of streets altogether. In The Sinking City, in Oakmont, we have something like 27 kilometres. So, in order to do 800 meters versus 27,000, without growing the number of resources, we had to change everything, and that was a necessary step in order to bring investigations to the open city. OPM: Can you tell us about the city building tool you used to make Oakmont? WA: We created a city editor, which was rather prominent because we used it, for example, to create Istanbul in eight hours [at a tech showcase in late 2018] – we use it to create very fast, large environments, and we had a lot of requests from architecture companies and other studios to have a look at the tool. But we also made a character editor, we also made a narration editor to help us very quickly prototype and create new cases. OPM: Oakmont feels like a city with real history. How did you get that level of subtlety, architecturally? WA: City creation, the lore, the world building is what gives you this part. In parallel with studying architecture and urbanism we created some world-building. We made the story of Oakmont starting from a million years ago, up to today [the 1920s]. And then we invented the history of Oakmont starting, you know, 2,000 years ago – starting in the 18th century with the settlers arriving. In development we even made maps of Oakmont developing through time in order to understand how the city would have grown from the settlers or even from a Viking settlement, admitting that the Vikings arrived in the US before Christopher Columbus – up to today 1920s, railroads, organised urban planning. OPM: Considering Lovecraft has some sketchy views regarding race relations, it’s nice to see some of the “monstrous” elements in his works humanised a little. Is this something you did consciously? OPM: Why did you decide to work on a Lovecraft game after doing so many based on Sherlock Holmes? What can you do in this new fictional world that you couldn’t before? WA: There’s a major difference between both universes. Sherlock Holmes, he’s after the truth, and the reality of the truth. In Lovecraft there is probably no “truth”, there is only “significance”, and that makes the detective work at the same time necessary and on the other side maybe useless, because the ending doesn’t really depend on you. So you could say it’s an evolutionary path, but an evolution regarding the free investigation, the concept of having no markers, no task – that is an evolution. Our previous games were location-based, linear and location-based. Here we are letting the player find his way inside the city, look at the addresses, go to the streets, find the addresses.